A groundbreaking study in Elsevier’s Ecological Economics journal by two French economists, for the first time proves the world has passed a point-of-no-return in its capacity to extract fossil fuel energy: with massive implications for the long-term future of global economic growth. The study, ‘Long-Term Estimates of the Energy-Return-on-Investment (EROI) of Coal, Oil, and Gas Global Productions’, homes in on the concept of EROI, which measures the amount of energy supplied by an energy resource, compared to the quantity of energy consumed to gather that resource. In simple terms, if a single barrel of oil is used up to extract energy equivalent to 50 barrels of oil, that’s pretty good. But the less energy we’re able to extract using that single barrel, then the less efficient, and more expensive (in terms of energy and money), the whole process. Recent studies suggest that the EROI of fossil fuels has steadily declined since the early 20th century, meaning that as we’re depleting our higher quality resources, we’re using more and more energy just to get new energy out. This means that the costs of energy production are increasing while the quality of the energy we’re producing is declining. But unlike previous studies, the authors of the new paper — Victor Court, a macroeconomist at Paris Nanterre University, and Florian Fizaine of the University of Burgundy’s Dijon Laboratory of Economics (LEDi)—have removed any uncertainty that might have remained about the matter. 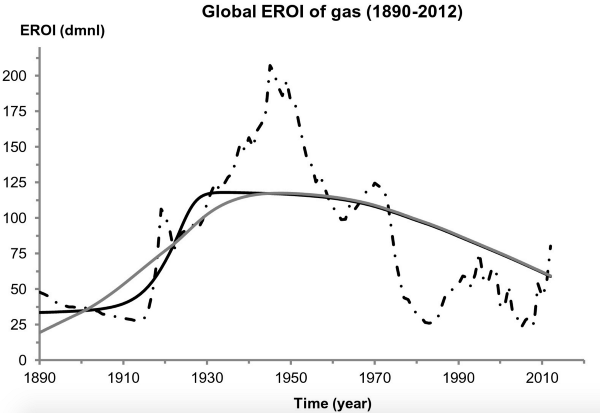 Court and Fizaine find that the EROI values of global oil and gas production reached their maximum peaks in the 1930s and 40s. Global oil production hit peak EROI at 50:1; while global gas production hit peak EROI at 150:1. Since then, the EROI values of oil and gas — the overall energy we’re able to extract from these resources for every unit of energy we put in — is inexorably declining. Even coal, the only fossil fuel resource whose EROI has not yet maxed out, is forecast to undergo an EROI peak sometime between 2020 and 2045. This means that while coal might still have signficant production potential in some parts of the world, rising costs of production are making it increasingly uneconomical. Since then, the total value of energy we’re able to extract from the world’s fossil fuel resource base has undergone a protracted, continuous and irreversible decline. 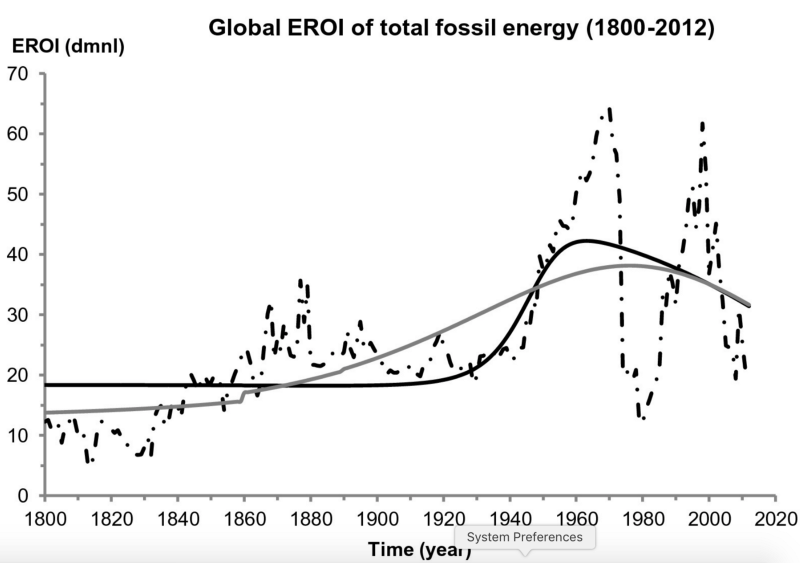 Insight: At this rate of decline, by 2100, we are projected to extract the same value of EROI from fossil fuels as we were in the 1800s. Several other studies suggest that this ongoing decline in the overall value of the energy extracted from global fossil fuels has played a fundamental role in the slowdown of global economic growth in recent years. In this sense, the 2008 financial crash did not represent a singular event, but rather one key event in an unfolding process. This is because economic growth remains ultimately dependent on “growth in material and energy use,” as a study in the journal PLOS One found last October. That study, lead authored by James D. Ward of the School of Natural and Built Environments, University of South Australia, challenged the idea that GDP growth can be “decoupled” from environmental impacts. exporting environmental impacts to other nations or regions, so that the realities of increasing material throughput can be suppressed from data calculations. growing inequality of income and wealth, which allows GDP to grow for the benefit of a few, while the majority of workers see decreases in real income —in other words, a wealthy minority monopolises the largest fraction of GDP growth, but does not increase their level of consumption with as much demand for energy and materials. Ward and his co-authors sought to test these factors by creating a new economic model to see how well it stacks up against the data. Other recent scientific research has further fine-tuned this relationship between energy and prosperity. Adam Brandt, a leading EROI expert at Stanford University’s Department of Energy Resources Engineering, in the March edition of BioPhysical Economics and Resource Quality proves that the decline of EROI directly impacts on economic prosperity. Axiom: So the more EROI declines, a greater proportion of the energy being produced must be used simply to extract more energy. This means that EROI decline leads to less real-world economic growth. It also creates a complicated situation for oil prices. While at first, declining EROI can be expected to lead to higher prices reflecting higher production costs, the relationship between EROI and prices begins to breakdown as EROI becomes smaller. This could be because, under a significantly reduced EROI, consumers in a less prosperous economy can no longer afford, energetically or economically, the cost of producing more energy — thus triggering a dramatic drop in market prices, despite higher costs of production. At this point, in the new era of shrinking EROI, swinging oil prices become less and less indicative of ‘scarcity’ in supply and demand. “The reduction in the fraction of a resource free and the energy system productivity extends from the energy system to all aspects of the economy, which gives an indication of the mechanisms by which energy productivity declines would affect general prosperity. Brandt’s model is theoretical, but it has direct implications for the real world. Insight: Given that the EROI of global fossil fuels has declined steadily since the 1960s, Brandt’s work suggests thata major underlying driver of the long-term process of economic stagnation we’re experiencing is resource depletion. Exactly how big the impact of resource depletion on the economy might be, can be gauged from a separate study by Professor Mauro Bonauiti of the Department of Economics and Statistics at the University of Turn. Bonauiti draws on anthropologist Joseph Tainter’s work on the growth and collapse of civilizations. Tainter’s seminal work, The Collapse of Complex Societies, showed that the very growth in complexity driving a civilization’s expansion, generates complex new problems requiring further complexity to solve them. Axiom: Complex civilizations tend to accelerate the use of resources, while diminishing the quantity of resources available for the civilization’s continued expansion — because they are continually being invested in solving the new problems generated by increasing complexity. The result is that complex societies tend to reach a threshold of growth, after which returns diminish to such an extent that the complexification of the society can no longer be sustained, leading to its collapse or regression. Bonauiti builds on Tainter’s framework and applies it to new data on ‘Total Factor Productivity’ to assess correlations between the growth and weakening in productivity, industrial revolutions, and the implications for continued economic growth. This threshold appears to have been reached by Europe, Japan and the US before the early 1970s, he argues. Of course, Court and Fizaine quantify the exact value of this peak EROI differently using a new methodology, but they agree that the peak occurred roughly around this period. The US and other advanced economies are currently tapering off the end of what Bonauiti calls the ‘third industrial revolution’ (IR3), in information communications technologies (ICT). This was, however, the shortest and weakest industrial revolution from a productivity standpoint, with its productivity “evaporating” after just eight years. In the US, the first industrial revolution utilized coal to power steam engine and telegraph technology, stimulating a rapid increase in productivity that peaked between between 1869 and 1892, at almost 2%. The second industrial revolution was powered by the electric engine and internal combustion engine, which transformed manufacturing and domestic consumption. This led productivity to peak at 2.78%, remaining at around 2% for at least another 25 years. Axiom: The highest level of productivity was reached around the 1930s, and since then with each industrial revolution has declined. The decline period also roughly corresponds to the post-peak EROI era for total fossil fuels identified by Court and Fizaine. Insight: The implication is that the 21st century represents the tail-end of the era of industrial economic expansion, originally ushered in by technological innovations enabled by abundant fossil fuel energy sources. 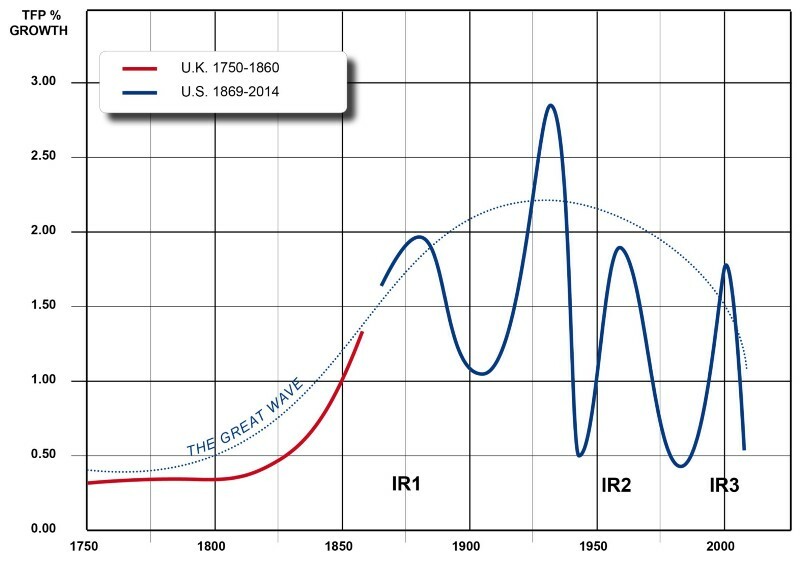 The latest stage is illustrated with the following graph which demonstrates the rapid rise and decline in productivity of the last major revolution in technological innovation (IR3). The productivity of the third industrial revolution thus peaked around 2004 and since then has declined back to near 1980s levels. In other words, the global economic system has entered a fundamentally new era, representing a biophysical phase-shift into an energetically constrained landscape. Going back to the new EROI analysis by French economists, Victor Court and Florian Fizaine, the EROI of oil is forecast to reduce to 15:1 by 2018. It will continue to decline to around 10:1 by 2035. They broadly forecast the same pattern for gas and coal: Overall, their data suggests that the EROI of all fossil fuels will hit 15:1 by 2060, and decline further to 10:1 by 2080. If these projections come to pass, this means that over the next few decades, the overall costs of fossil fuel energy production will increase, even while the market value of fossil fuel energy remains low. The total net energy yield available to fuel continued economic growth will inexorably decline. This will, in turn, squeeze the extent to which the economy can afford to buy fossil fuel energy that is increasingly expensive to produce. We cannot be sure what this unprecedented state of affairs will herald for the market prices of oil, gas and coal, which are unlikely to follow the conventional supply and demand dynamics we were used to in the 20th century. But what we can know for sure from the new science is that the era of unlimited economic growth — the defining feature of neoliberal finance capitalism as we know it — is well and truly over. The real-world workings of this insight have been set out by a team of economists at the University of Leeds’ Centre for Climate Change Economics and Policy, whose research was partly funded by giant engineering firm Arup, along with the main UK government-funded research councils — the UK Energy Research Centre, the Economics and Social Research Council and the Engineering and Physical Sciences Research Council. In their paper published by the university’s Sustainability Research Institute this January, Lina Brand-Correa, Paul Brockway, Claire Carter, Tim Foxon, Anne Owen, and Peter Taylor develop a national-level EROI measure for the UK. Studying data for the period 1997-2012, they find that “the country’s EROI has been declining since the beginning of the 21st Century”. This also implies that the UK has had to sustain continued economic growth through other mechanisms outside of its own domestic energy context: in particular, as we know, the expansion of debt. It is no coincidence, then, that debt-to-GDP ratios have continued to grow worldwide. As EROI is in decline, an unsustainable debt-bubble premised on exploitation of working and middle classes is the primary method to keep growth growing — an endeavour that at some point will inevitably come undone under its own weight. According to MIT and Harvard trained economist Dr. June Sekera — who leads the Public Economy Project at Tufts University’s Global Development And Environment Institute (GDAE) — net energy decline proves that neoclassical economic theory is simply not fit for purpose. Yet a key problem is that mainstream economics is held back from being able to even comprehend the existence of net energy decline due to an ideological obsession with the market. The result is that production that occurs outside the market is seen as an aberration, a form of government, state or ‘political’ interference in the ‘natural’ dynamics of the market. The only problem is that, as Sekera herself recognizes, the main incubator and agent of the non-market public economy is government — but government itself is playing a key role in dismantling, hollowing-out and privatizing the non-market public economy. Citizens themselves at all scales have an opportunity to work together to salvage and regenerate new public economies based on pooling their human, financial and physical assets and resources, to facilitate the emergence of more viable and sustainable economic structures. 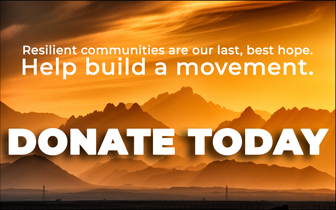 Part of this will include adapting to post-carbon energy sources. Far from representing the end of prosperity, this transition represents an opportunity to redefine prosperity beyond the idea of endlessly increasing material accumulation; and realigning society with the goal of meeting real-world human physical, psychological and spiritual needs. What will emerge from efforts to do so has not yet been written. But those efforts will define the contours of the new post-carbon economy, as the unsustainable juggernaut of the old grinds slowly and painfully to a protracted, chaotic halt. In coming years and decades, the reality of the need for a new economic science that reflects the dynamics of the economy’s fundamental embeddedness in the biophysical environment will become evermore obvious. So say goodbye to endless growth neoliberalism.